Not only does L&V Sweets offer a wide variety of chocolates, but they also offer custom cookies with colours and patters for any holiday or occasion. If you’re in Montreal you can easily order these beautiful delights, both delicious and decorative with gold foil detailing. For those of you who are not, we didn’t forget about you. I've teamed up with the awesome creator of L&V sweets, Lara, to create a DIY version for everyone at home. Crumble the Oreo cookies and chop up the gummy bears in to two separate bowls dishes and set aside. Place 1 cup of chocolate at a time in a microwave safe bowl. Microwave on low stirring at 50 second intervals until chocolate is completely melted. 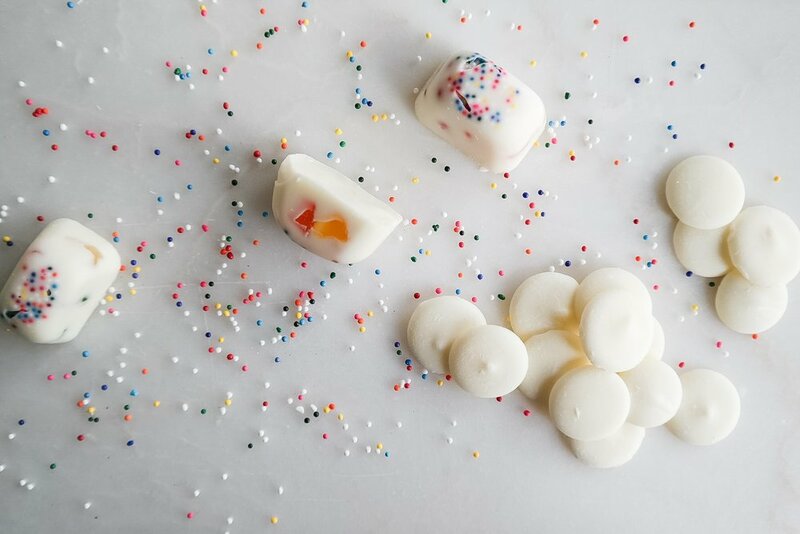 Scatter sprinkles into the base of each section of your ice tray. Spoon in the melted chocolate ¼ of the way. Add a layer of either gummies or cookies (or both!) to each section. Place in the fridge until chocolate has hardened (about 10 minutes). It really is as simple as that! Then all you have to do is remove from tray and enjoy. Your guests will be just as excited about the delicious treats as you are about the easy clean up and prep. Wishing you, your family and friends as sweet easter weekend!